PT Multi Terminal Indonesia - MTI or later known as "IPC Logistic Services or IPC Multi Terminal" is an Indonesia private company with a core business in port logistic services. IPC Logistic Services has its business activities focused in domestic and international freight forwarding, warehousing and distribution, customs clearance, yard, project cargo, fleet trucking and car box, stevedoring via train station pasoso, and place examination Integrated (TPfT) CDC Banda. IPC Logistic Services is a logistic subsidiary company of PT Pelabuhan Indonesia II (Persero) or most commonly known as Indonesian Port Corporation (IPC Group), one of the largest state-owned port operators in Indonesia. At present, 99.9% s of its shares are held by IPC Group and 0.1% remaining shares by the Maritime Employees Association (KOPEGMAR). 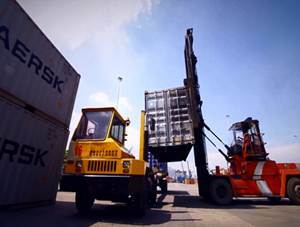 According to PT Multi Terminal Indonesia's company profile as cited by JobsCDC.com, PT Multi Terminal Indonesia was first established in 2002 as as a spin-off results of the Terminal Business Division (DUT) of the Port Tanjung Priok branch. IPC Logistic Services is based in Jakarta and its head office is located at Jl Pulau Payung No 1 Tanjung Priok Jakarta 14310. At present, IPC Multi Terminal runs its business 6 branch offices throughout Indonesia; Jakarta Branch, Surabaya Branch, Banten Branch, Cirebon Branch and Semarang Branch. Candidate holds at least a Diploma Degree (D3) in any majors. Holds around 1-3 years of experience in logistic industry. Familiar with the operation process. Have a good communication and negotiation skills. Holds around 1-3 years experience in logistic industry and familiar with the operation process. Previous experience as sales international in forwarding. JobsCDC.com now available on android device. Download now on Google Play here. Please be aware of recruitment fraud. The entire stage of this selection process is free of charge. PT Multi Terminal Indonesia - D3 Marketing, International Marketing IPC Group September 2016 will never ask for fees or upfront payments for any purposes during the recruitment process such as transportation and accommodation.